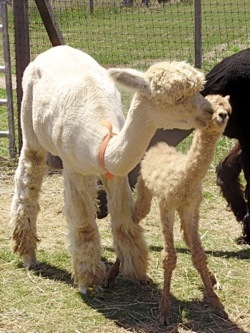 Island Alpaca is proud to host a birthing and neonatal clinic with Dr. Cheryl DeWitt, DVM. This clinic is a must-have for all future breeders, experienced breeders and veterinarians. Other livestock breeders will certainly benefit from this seminar. If you are interested in attending a future Birthing/Neonatal Clinic, please let us know. Next clinic is May 13, 2017. Reserve your space early, as 2014 was a full class! Course-book, breakfast and lunch provided. Class size limited to optimize learning. 9:30 am-5:00 pm. $200, and $150 for additional participants from the same farm. (Repeat a class, for just $100) The price of the workshop is refundable should the attendee purchase alpacas or breedings to any of Island Alpaca fully-owned herd sires.